On seventh day of search for terrorist Nashat Milhem, police and Shin Bet shift pursuit of shooter to northern region. 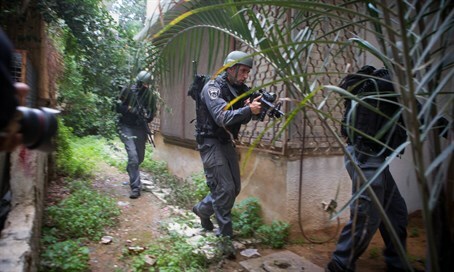 The hunt for terrorist Nashat Milhem is on its seventh day, and on Thursday, searches officially ended in Tel Aviv. City police forces returned to routine emergency protocol typical of this time. While many police officers can still be seen patrolling the streets of Tel Aviv, the goal is not necessarily to catch the terrorist, but to give residents a sense of security and to provide a rapid response in the event of another terrorist attack. The main focus in today’s hunt is the northern region. Security forces continue to work despite having no definite knowledge regarding the specific location of the escaped terrorist who murdered three people last Friday. Unlike the systematic house-to-house searches that were conducted in Tel Aviv, the searches up north are based on intelligence information. Security forces are only entering certain homes if they have probable reason to believe Nashat Milhem may be hiding there. Since Melham’s whereabouts have been unknown for nearly a week, it can be assessed that collaborators are providing the terrorist with food and shelter. Several of his family members, including his father, have been arrested on suspicions of aiding him.